Graduated Cylinders and Beakers are both common pieces of laboratory equipment. A Graduated Cylinder has a narrow cylindrical shape with each marked line showing the volume of liquid being measured. While they are generally more accurate and precise than laboratory flasks and beakers, they should not be used to perform volumetric analysis. They are also sometimes used to measure the volume of a solid indirectly by measuring the displacement of a liquid. Whatever your use may be, these varieties can handle the task. The Beaker’s main function is stirring, mixing and heating liquids. A Beaker has a cylindrical shape with a flat bottom and most include a small spout for pouring. They are available in a variety of sizes, ranging from one milliliter up to several liters. Large graduated cylinders are most often made from polypropylene and polymethylpentene. These are the two most widely used synthetic plastics in the world today: polypropylene for its powerful chemical resistance, and polymethylpentene for its transparency which makes it lighter and easier to use than glass. Polypropylene (PP) is easy to repeatedly autoclave. However, autoclaving more than about 121 °C (250 °F) can warp or damage polypropylene graduated cylinders which, in turn, affects its accuracy. Due to its chemical formulation, average commercial grade polypropylene melts at more than 177 °C (351 °F)). 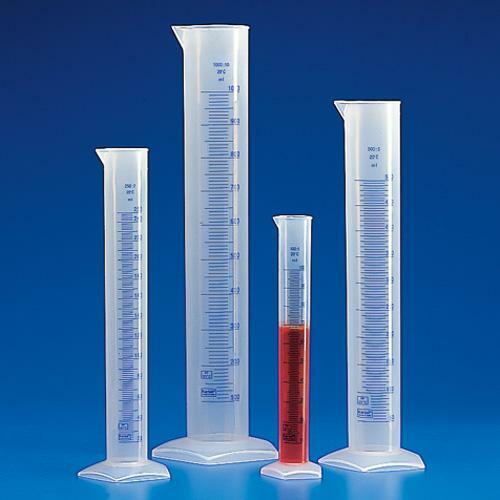 The I H N traditional graduated cylinder, often narrow and tall, increases the accuracy and precision of volume measurement. It has a plastic or glass bottom and a spout for easy pouring of measured liquids. There are additional versions which are wide and low that you can find here. Instead of a spout, Mixing Cylinders have ground glass joints. They can be closed with a stopper or connect directly with other elements of a manifold. With mixing cylinders, the metered liquid does not pour directly, but is often removed using a cannula. A graduated cylinder is meant to be read with the surface of the liquid at eye level, where the center of the meniscus shows the measurement line. Typical capacities of graduated cylinders are from 10 mL to 1000 mL. Beakers may be made of glass, metals such as stainless steel or aluminum, or certain plastics like polythene or polypropylene. A common use for polypropylene beakers is gamma spectral analysis of liquid and solid samples. The Standard or "low-form" beakers, which are often referred to as Griffin Beakers, typically have a height about 1.4 times their diameter. Griffin Beakers are the most often used, with purposes varying from preparing solutions and decanting supernatant fluids to holding waste fluids prior to disposal to performing simple reactions. Essentially, low form beakers are likely to be used in some way when performing just about any chemical experiment. "Tall-form” beakers, also called Berzelius Beakers, have a height about twice their diameter, and are mostly used for titration. Flat beakers are often called crystallizers because most are used to perform crystallization. However, they are also often used as a vessel for use in hot-bath heating. These beakers usually do not have a flat scale. There are two classes of accuracy for reading graduated cylinders. Class A has double the accuracy of Class B. Cylinders can have single or double scales. Single scales allow the volume to be read from top to bottom (filling volume), while double scale cylinders allow reading for filling and pouring (reverse scale). To read the volume accurately, the observation must be at an eye level to be read at the bottom of the meniscus of the liquid level. Beakers are often graduated or marked on the side with lines indicating the contained volume. For instance, a 250 mL beaker might be marked with lines to indicate 50, 100, 150, 200, and 250 mL of volume. These marks are not intended for obtaining a precise measurement of volume (a graduated cylinder or a volumetric flask would be a more appropriate instrument for such a task), but rather an estimation. The presence of a spout means that the beaker cannot have a lid. However, when in use, beakers may be covered by a watch glass to prevent contamination or loss of the contents, but allow venting via the spout. Alternatively, a beaker may be covered with another larger beaker that has been inverted, though a watch glass is preferable. These beakers are the most accurate you can find.